Our range of products include lift inverters. 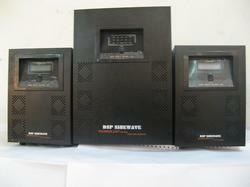 Automatic Lift Backup Inverter/UPS is designed to generate 3-phase output with neutral. This type of Inverter/UPS is widely used in lift/ elevators during the power failure. Also, this UPS supports other important loads like staircase, parking, compound & common lighting & security system, etc. The heart of This Inverter/UPS is 32Bit DSP Sine wave three-phase inverter, isolated battery charger, and an auto change over system. Whenever the utility supply is available, the charger provides constant voltage and constant current to charge the battery bank.